Communication and ‘framing’ strategies are part of the toolkit used by lobbyists to influence policy making. But do such strategies have a real impact on policy outcomes? 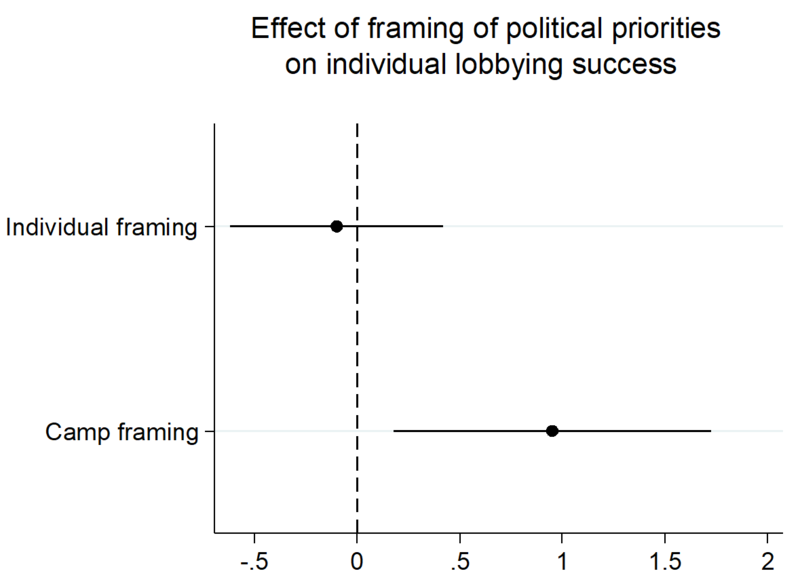 Drawing on new research from five European countries, Wiebke Marie Junk and Anne Rasmussen show that framing strategies only work as part of a team effort, but they can have a substantial effect on the lobbying success of individual lobbyists. The United States’ Republican senator Ted Cruz once stated in an interview with the New Yorker that “in both law and politics… the essential battle is the meta-battle of framing the narrative”. This ‘framing’ refers to the strategic choice of emphasising some aspects of an issue rather than others in the public debate. The issue of nuclear power, for instance, can be ‘framed’ as a matter of environmental benefits in contrast to coal, but also as a security issue due to the threat of accidents or terror attacks. Similarly, the issue of the Transatlantic Trade and Investment Partnership (TTIP) has not only been framed by supporters or opponents as a matter of trade and economic relations between the European Union and the United States, but also as an issue with major environmental implications for the counties involved. This ‘meta-battle of framing’, as Cruz called it, might have consequences for the outcomes of policy negotiations if these narratives affect which political decisions are seen as most appropriate or legitimate. Whereas practitioners on the political battlefield might believe in the power of framing and use it as a tool to advocate their position, the academic literature has only begun to quantify the actual effects of framing and the mechanisms through which it is effective. In a recent study, we seek to contribute to this literature by assessing the effects of framing on lobbying success by over 600 non-state actors, such as business organisations, Non-Governmental Organisations (NGOs) and trade unions, in five Western European countries (Germany, Denmark, the Netherlands, Sweden and the United Kingdom). Newspaper articles on 50 diverse issues were coded to capture whether actors refer to substantive priorities of policy making in these debates, such as to safety concerns, implications for the economy, the environment, or to rights-based arguments, when advocating their preferred policy position. We then analysed whether and how framing plays a role in explaining who wins and loses the battle of trying to attain favourable policy outcomes. Our main finding is that this battle is essentially a team effort. Individual frames of an issue voiced by single lobbyists are unlikely to reach and affect policy makers or the public debate at large. In contrast, the frames that get voiced collectively by all lobbyists supporting the same position – for instance all those in favour of building nuclear power plants – can affect policy outcomes. 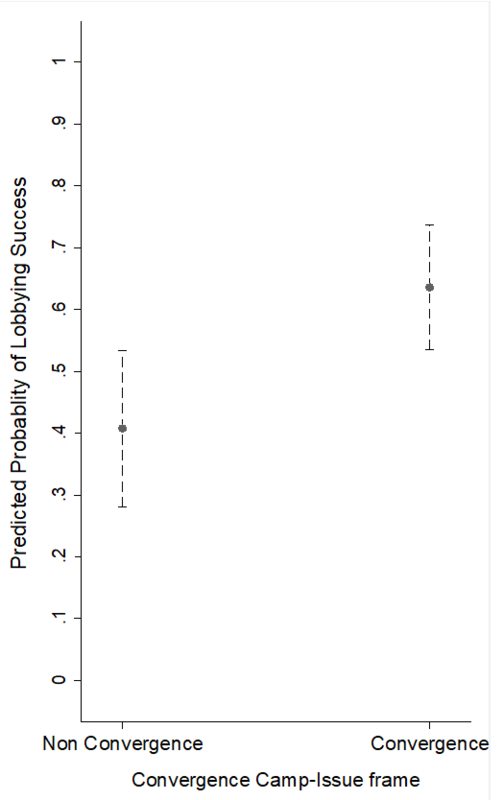 We call this group of all lobbyists on the same side of an issue a lobbying ‘camp’ and find that the framing by an actor’s camp affects lobbying success, whereas the actor’s individual framing has no significant effect. Our results therefore suggest that success through framing is largely the result of a collective process at the camp level, rather than of framing efforts by individual lobbyists. In the case of the frames of political priorities we assessed, the effect is positive. As Figure 1 shows, individual actors benefit when their camps promote one of the coded frames in the media arena. In contrast, their individual frames have no significant effect. Note: Plot based on Model 2. For more information, see the authors’ accompanying journal article. We also address the question of how camp frames work to affect lobbying success. We argue, firstly, that in order to impact the public debate and convince policymakers, it is crucial to what extent a camp of likeminded lobbyists speaks in unity with one voice, meaning how consistently the issue is framed by the camp, for instance as an environmental issue. Our results show that predicted lobbying success varies significantly depending on how much the actor’s camp frames the issue consistently, rather than mixing diverse frames. As Figure 2 illustrates, the predicted probability of lobbying success based on one of our models increases from 26% to 65% as the unity of camp framing moves from its observed minimum to maximum. Note: Plot based on Model 3 – for more information, see the authors’ accompanying journal article. Secondly, we argue that it is crucial for lobbying success how the contest of frames between opposing lobbying camps plays out. The results reveal that predicted lobbying success increases where the frame most strongly promoted by an actor’s camp also comes to dominate the debate at the issue level. 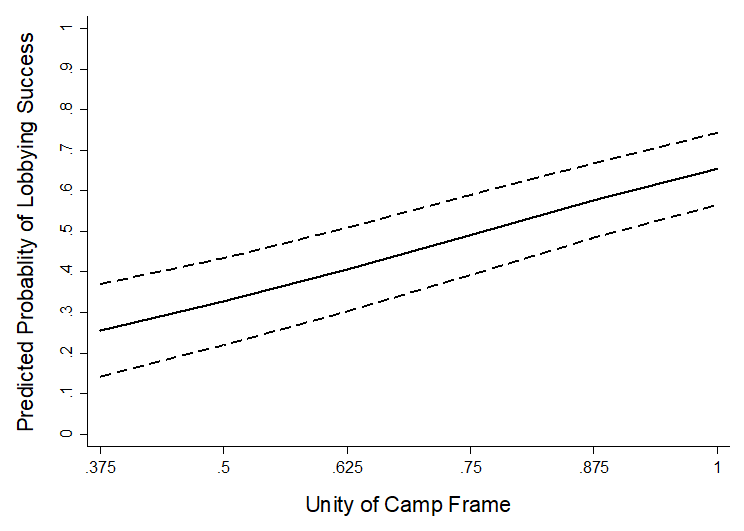 Figure 3 shows that the predicted probability of preference attainment for an actor increases from 41% to 63% where the camp-level frame comes to dominate the issue vis-à-vis the opposing frame, compared with a scenario where a different frame dominates the issue. Note: Plot based on Model 5 – for more information, see the authors’ accompanying journal article. Our results speak in important ways to the framing ‘battle’ mentioned by Cruz. We show how the collective struggle between opposing sides trying to dominate the narrative of an issue is important for the likelihood that individual groups succeed in attaining their policy goals. The findings are insightful for scholars and citizens wishing to understand how the alignment of political arguments on an issue is related to actual political decisions. Moreover, they imply that actors within a lobbying camp promoting the same policy position on an issue are essentially a community of fate, strongly interdependent when it comes to the effects of their framing strategies. From the view of lobbyists, this verdict is a pointer to the need for active cooperation to align strategies when seeking to influence policy outcomes. From the perspective of scholars in political science and communication, this also means that we should place more attention on the interdependence of strategies and outcomes between actors when studying why policies come to look the way they do. Wiebke Junk is a PhD candidate in the Department of Political Science at the University of Copenhagen.